Keywords: Multi-walled carbon nanotubes, TEOS, chitosan, in vitro release kinetics, soyasapogenol B, in vitro cytotoxicity. Keywords:Multi-walled carbon nanotubes, TEOS, chitosan, in vitro release kinetics, soyasapogenol B, in vitro cytotoxicity. Abstract:Background: Using Multi-Walled Carbon Nanotubes (MWCNTs) as a drug delivery system, can avoid the need for solvents and preventing drug precipitation in aqueous solution. Soyasapogenol B (SSB) acts as an important therapeutic agent owing to its numerous reported biological activities. 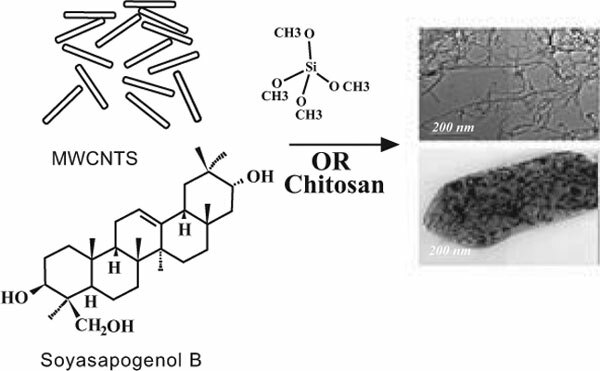 Hence, this work deals with preparation and characterization of SBB loaded onto functionalized MWCNTs with tetraethyl orthosilicate (TEOS) and/or chitosan.